Wei, X., Zhou, S., Huang, Y., Huang, J., Chen, P., Wang, Y., Zhang, X., Tu, Y., Peng, L., and Xia, T. (2016). "Three fiber crops show distinctive biomass saccharification under physical and chemical pretreatments by altered wall polymer features," BioRes. 11(1), 2124-2137. Jute, kenaf, and ramie are important fiber crops in the textile industry, but their core stalks have not been well used. In this study, three fiber crops were examined with enhanced hexoses yields (% cellulose) up to 4.8-, 3.6-, and 1.9-fold from enzymatic hydrolysis of the steam-exploded stalks. Sequential dilute acid/alkali pretreatments achieved the increased hexoses yields up to 7.6-, 4.8-, and 2.8-fold. Without steam explosion, the three crops could increase hexoses yields under extremely high concentrations of NaOH (12% to 16%). While kenaf and ramie mainly showed hemicelluloses removal with steam explosion, jute exhibited an effective co-extraction of hemicelluloses and lignin, which greatly reduced its cellulose DP, hemicellulosic Xyl/Ara, and G-monomer. These findings explain why jute had the highest hexoses yield among the three crops and also suggest that G-monomer and Xyl may interact in a way that mainly determines wall polymers co-extraction with steam explosion. Contact information: a: Biomass and Bioenergy Research Centre, Huazhong Agricultural University, Wuhan 430070, China; b: National Key Laboratory of Crop Genetic Improvement, Huazhong Agricultural University, Wuhan 430070, China; c: College of Plant Science and Technology, Huazhong Agricultural University, Wuhan 430070, China; d: Department of Biotechnology, Hunan Agricultural University, Changsha 410128, China; e: College of Life Science and Technology, Huazhong Agricultural University, Wuhan 430070, China; *Corresponding author: xiatao@mail.hzau.edu.cn; Web: http://bbrc.hzau.edu.cn. Jute (Corchorus capsularis L.), kenaf (Hibiscus cannabinus L.), and ramie (Boehmeria nivea (L.) Gaud) are important fiber crops with vast growth and high fiber production. In China alone, ramie is annually cultivated on 80,000 hectares with 150,000 tons of fiber production, whereas jute and kenaf can reach 19,300 hectares (FAO 2012). Due to the high fiber quality, the stalk basts of these crops have been broadly used in the textile industry (Lam et al. 2003; Angelini and Tavarini 2013), but little has been reported about the core stalk applications in biofuel production. Lignocellulose has been regarded as the major biomass source for the second generation of biofuels. Principally, biomass processing includes three major steps: physical and chemical pretreatments for wall polymer disassociation, enzymatic digestion for soluble sugar release, and yeast fermentation for ethanol production (Rubin 2008). Plant cell wall composition and wall polymer features can fundamentally determine biomass recalcitrance (Himmel et al. 2007), leading to a costly lignocellulosic digestion. Hence, it is important to find out the wall polymer factors affecting biomass enzymatic digestion using an appropriate pretreatment. Acids and alkalis, such as H2SO4 and NaOH, are the classical chemicals used in biomass pretreatments. Generally, alkali pretreatment can mostly extract entire wall polymers by disassociation of hydrogen bonds, whereas acid pretreatment partially releases monosaccharides, oligosaccharides, and lignin monomers (Dien et al. 2006; Hendriks and Zeeman 2009; Kumar et al. 2009; Jordan and Bowman 2012). Steam explosion has been regarded as an economical and environmentally friendly pretreatment that greatly reduces biomass particle size and extracts wall polymers (Jørgensen et al.2007; Alvira et al. 2010). Although both physical and chemical pretreatments have been applied to many plants, it remains to test their effectiveness in jute, kenaf, and ramie. Plant cell walls are composed mainly of cellulose, hemicelluloses, and lignin. Cellulose crystallinity and degree of polymerization (DP) have been characterized as negative factors affecting biomass digestibility (Chang and Holtzapple 2000; Klemm et al. 2005; Pan et al. 2008; Xu et al. 2012; Zhang et al. 2013). Furthermore, the hemicellulose content is negatively correlated with the degree of cellulose crystallinity for high biomass saccharification under H2SO4 and NaOH pretreatments in many plant species examined (Xu et al. 2012; Zhang et al. 2013; Wu et al. 2013; Jia et al. 2014). In particular, arabinose substitution degree of xylans (reverse Xyl/Ara) has been discovered as a positive factor relative to biomass digestibility upon various chemical pretreatments (Wu et al. 2013; Li et al. 2013). By comparison, lignin can greatly contribute to lignocellulosic recalcitrance (Baucher et al. 1999; Chen and Dixon 2007; Alvira et al. 2010), but it may play dual roles in biomass enzymatic digestions distinctive in different plant species (Boerjan et al. 2003; Klinke et al. 2004; Studer et al. 2011; Xu et al. 2012). The positive effect of lignin in certain cases may be due to two major actions: (1) The minor lignin-hemicelluloses complex could maintain cellulose microfibres at native state for cellulase enzyme accessible after physical and chemical pretreatment (Li et al. 2014c); (2) The increased three monolignols in genetic mutants and transgenic plants could not be well associated as a complete lignin-carbohydrate complex, resulting in open cell walls for cellulase enzyme loading and accession (Li et al. 2014d). However, those wall polymer features have not been well examined for their impacts on biomass enzymatic digestibility in three fiber crops under physical pretreatments, in particular in the case of steam explosion. In the present work steam explosion was performed under moderate conditions, followed by chemical (H2SO4, NaOH) pretreatments with the core stalks in the three fiber crops. Then, their sequential biomass enzymatic saccharification was compared by calculating hexose yields released. Finally, the steam explosion action modes were characterized relative to the extraction of cell wall polymers and the alterations of those extracted substances that were distinctive among the fiber crops. Jute (C. capsularis L.), kenaf (H. cannabinus L.) and ramie (B. nivea (L.) Gaud) were grown in the experimental field, Hunan, China. The mature stalks of 5 to 10 plants of each species were harvested, dried at 50 C, and ground into powders passing through a 40-mesh screen. The procedure of plant cell wall fractionation was used to extract wall polymers as described by Peng et al. (2000). All experiments were carried out in triplicate. Hexoses and pentoses were, respectively, detected by the anthrone/H2SO4 and the orcinol/HCl methods as described by Huang et al. (2012) using a UV-vis spectrometer (V-1100D, Shanghai MAPADA Instruments Co. Ltd. Shanghai, China). As high pentoses can affect the absorbance reading for hexoses content, the deduction from pentoses reading at 660 nm was carried out for final hexoses calculation. A series of xylose concentrations were analyzed for plotting the standard curve referred for the deduction, which was verified by gas chromatography-mass spectrometry (GC-MS) analysis. D-glucose and D-xylose purchased from Sinopharm Chemical Reagent Co., Ltd. were used in the standard curves drawing for hexoses and pentoses assay. All experiments were conducted in triplicate. Total lignin content was measured by the two-step acid hydrolysis method as described by Wu et al. (2013). All experiments were carried out in triplicate. Monolignols were detected using HPLC according to the method described by Xu et al. (2012). Standard chemicals: p-Hydroxybenzaldehyde (H), vanillin (G), and syringaldehyde (S) were purchased from Sinopharm Chemical Reagent Co., Ltd.
Total hemicelluloses were calculated by counting total hexoses and pentoses from KOH-extractable and non-KOH-extractable hemicelluloses. Monosaccharides of hemicelluloses were determined using GC-MS (GCMSQP2010 Plus, SHIMADZU Corporation, Japan) as previously described by Li et al.(2013). TFA (Trifluoroacetic acid) and myo-inositol were obtained from Aladdin Reagent Inc. Acetic anhydride and monosaccharide standards (L-rhamnose, L-arabinose, L-fucose, D-xylose, D-galactose, D-glucose, and D-mannose) were purchased from Sinopharm Chemical Reagent Co., Ltd. 1-Methylimidazole was obtained from Sigma-Aldrich Co. LLC. The X-ray diffraction method was used for determining cellulose crystalline index (CrI) using Rigaku-D/MAX instrument (Uitima III, Japan) as described by Huang et al. (2015). Standard error of the CrI method was detected at ± 0.05 to approximately 0.15 using five representative samples in triplicate. Steam explosion: Core stalk samples were cut into 5 to 8 cm lengths and sprayed with deionized water to 50% moisture for steam explosion. The chopped cotton stalk samples (200 g, dry matter) were put into a 5 L steam explosion reactor (QBS-200, Hebi Zhengdao Machine Factory, Hebi, China), and treated at 225 C (2.5 MPa) for 3 min. The severity parameter of steam explosion was calculated to be 4.22 (2.5 MPa/3 min) as described by Huang et al. (2015). The steam-exploded samples were dried in air, ground into powders through 40 mesh screen, and stored in dry container until in use. H2SO4 pretreatment (solid-liquid ratio, 1:20/g:mL) was carried out as described by Huang et al. (2012). The well-mixed biomass samples were added with 6 mL H2SO4 at various concentrations: 1.0%, 2.0%, 4.0%, 8.0%, and 12.0% H2SO4 (v/v) used for raw stalk samples, and 0.25%, 0.5%, 1.0%, and 1.5% H2SO4 (v/v) for the steam-exploded samples. The sealed samples were heated at 121 C for 20 min in an autoclave (15 psi), and shaken under 150 rpm for 2 h at 50 C. After centrifugation at 3,000 g for 5 min, the pellets of samples were washed with 10 mL distilled water for 3 to 5 times until no sugar was detected, and stored at -20 C until in use for enzymatic hydrolysis. All experiments were carried out in triplicate. NaOH pretreatment (solid-liquid ratio, 1:20/g:mL) was also performed as described by Huang et al. (2012) with minor modification. The well-mixed biomass samples were added with 6 mL of NaOH at various concentrations: 1.0%, 2.0%, 4.0%, 8.0%, 12.0%, 16.0%, and 20.0% NaOH (w/v) used for raw stalk samples, and 0.25%, 0.5%, 1.0%, 1.5% NaOH (w/v) for the steam-exploded samples. The sealed samples were shaken at 150 rpm for 2 h at 50 C, and centrifuged at 3,000 g for 5 min. The pellets of samples were washed with 10 mL distilled water for 3 to 5 times until no sugar was detected, and stored at -20 C until in use for enzymatic hydrolysis. All experiments were carried out in triplicate. The enzymatic hydrolysis was performed according to previous description (Huang et al. 2015) with minor modification. The neutralized residues were treated with 6 mL (1.6 g/L) mixed-cellulases (protein concentration, ≥100mg/g) containing β-glucanase (≥2.98 × 104 U), cellulase (≥298 U), and xylanase (≥4.8 × 104 U) purchased from Imperial Jade Bio-technology Co., Ltd. and shaken under 150 rpm for 48 h at 50 C. The supernatants were collected, after centrifugation at 3,000 g for 5 minutes, to determining total pentoses and hexoses yields released from enzymatic hydrolysis using a colorimetric assay as described above. The samples only added with 6 mL reaction buffer (Acetate Buffer) were shaken for 48 h at 50 C and regarded as the control. All experiments were carried out in triplicate. Cell wall compositions were determined for jute (C. capsularis L.), kenaf (H. cannabinus L.), and ramie (B. nivea (L.) Gaud). In the mature raw core stalks, these three crops exhibited distinct cell wall compositions (Table 1, Table A.1). Ramie showed a relatively high cellulose level (41.5% dry matter) and low lignin (22.5%), whereas jute had relatively high hemicelluloses content (26.0%; Table A.1), and kenaf had low cellulose content (34.8%; Table A.1). However, all three fiber crops exhibited much higher cellulose levels than that reported for most grass plants (Xu et al. 2012; Wu et al. 2013; Li et al.2013; Jia et al. 2014). Hence, the three fiber crops could provide cellulose-rich biomass in the core stalks. Furthermore, the mature core stalks were pretreated with steam explosion. As a result, the steam explosion led to a distinctive wall polymer extraction in the three fiber crops (Table 1). In general, jute, kenaf, and ramie respectively showed hemicelluloses extractions with steam explosions of 68%, 69%, and 75%. However, jute also showed lignin extraction of 56%, whereas kenaf and ramie had lignin removals of 12% and 5% respectively. Hence, jute had a relatively reduced cellulose level by 5%, and kenaf exhibited an increased cellulose level by 12% at p < 0.01 (n = 3, t-test). By comparison, ramie did not show significant cellulose alternation at p > 0.05. Although steam explosion has been reported as playing a predominant role in hemicelluloses extraction (Alvira et al. 2010; Qiu and Chen 2012; Huang et al. 2015), the jute showed a more effective co-extraction for both hemicelluloses and lignin in the core stalks, indicating that jute is unique in terms of wall polymers co-extractions with steam explosion. The biomass enzymatic saccharification (or digestibility) was measured by calculating the hexoses yield (% cellulose) of enzymatic hydrolysis of biomass after pretreatment (Wu et al. 2013). To test steam explosion enhancement on biomass saccharification, two-step pretreatments (steam explosion followed with acid/alkali) were performed in the three fiber crops. 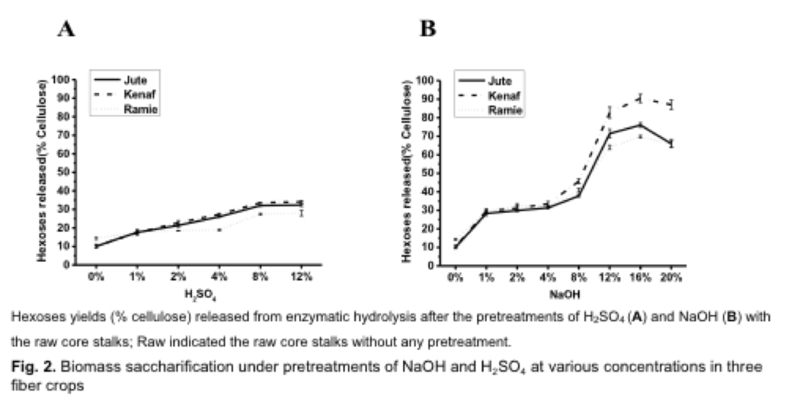 Upon the first-step pretreatment (steam explosion only), jute, kenaf, and ramie respectively exhibited hexoses yields released from enzymatic hydrolysis at 48%, 37%, and 27% (Fig. 1; Table A.2), which were 2 to 4 folds higher than that of the raw core stalks (control, without steam explosion). Under sequential dilute acid (H2SO4 at various concentrations) pretreatments with the steam-exploded residues, jute, kenaf, and ramie showed largely increased hexoses yields up to 76%, 49%, and 40%, respectively (Fig. 1A). Notably, a similar increase in hexoses yields was also observed in the sequential dilute alkali (NaOH) pretreatments (Fig. 1B), which was different from previous observations that alkali pretreatments can lead to much higher hexoses yields than those of acid pretreatments with raw biomass in many plant species (Xu et al. 2012; Wu et al. 2013; Li et al. 2014a; Jia et al. 2014). As steam explosion is somewhat like the acid pretreatment, which could predominately remove hemicelluloses (Jørgensen et al. 2007; Alvira et al. 2010), the present findings may imply that the sequential dilute acid and alkali pretreatments could lead to a similar enhancement on biomass saccharification in the three fiber crops. In addition, jute exhibited much higher hexoses yields than those of kenaf and ramie from the sequential acid and alkali pretreatments, due to large extractions of both hemicelluloses and lignin in jute samples (Table 1). Compared with steam explosion enhancement on biomass saccharification, classic chemical pretreatments were also performed in the raw core stalks (without steam explosion) using various concentrations of H2SO4 and NaOH (Fig. 2; Table A.3). Pretreated with low concentrations of H2SO4(1%, 2%) and NaOH (1%, 2%, 4%), the three fiber crops showed close hexoses yields. Under extremely high concentrations of H2SO4 (12%), however, the fiber crops had the highest hexoses yields ranging from 28% to 34% (Fig. 2A; Table A.3), which were much lower than that of the dilute acid pretreatment with the steam-exploded residues (Table A.2). By comparison, the NaOH pretreatments led to hexoses yields higher than those of H2SO4 pretreatments by 2 to 3 folds (Fig. 2B, Table A.3), consistent with the previous observations in other plant species examined (Xu et al. 2012; Wu et al. 2013; Li et al. 2014a; Jia et al. 2014). Notably, extremely high alkali concentration (16%) could respectively yield the highest hexoses levels, i.e. 76%, 90%, and 70% (Table A.2) in jute, kenaf, and ramie, among all pretreatments applied in this study including the pretreatment of steam explosion followed with dilute alkali (Table A.2). In particular, the kenaf showed higher hexoses yield than the jute (Fig. 2B), compared to the pretreatment of steam explosion followed with dilute alkali (Fig. 1B). However, although chemical pretreatments could efficiently lead to the biomass digestions, harsh pretreatment (extremely high concentration) conditions are required, which could result in releasing abundant toxic compounds that seriously inhibit yeast fermentation (Klinke et al. 2004; Li et al. 2014b). In addition, the application of concentrated chemicals is less economical, regarding the high cost in chemical consumption and that pH neutralization and corrosion wear on machines (Kumar et al. 2009). To understand the effects of steam explosion enhancements on biomass enzymatic saccharification, three major wall polymer features were characterized in the fiber crops. In terms of the cellulose features, lignocellulose crystalline index (CrI) and degree of polymerization (DP) of crystalline cellulose were detected in this work (Table 2; Table A.4). In the raw core stalks (without steam explosion), kenaf demonstrated a lower CrI value than that of jute, whereas ramie had higher CrI than that of jute (Table A.4). As lignocellulose CrI is a negative factor on biomass enzymatic digestibility under various pretreatments in many plant species examined (Chang and holtzapple 2000; Zhang et al. 2013; Wu et al. 2013; Li et al. 2013; Li et al. 2014a), this could explain why kenaf showed higher hexoses yields than those of jute under 16% NaOH pretreatment, while ramie had the lowest hexoses yields under H2SO4 pretreatments among the three fiber crops (Fig. 2). By comparison, the steam explosion could significantly increase lignocellulose CrI and reduce crystalline cellulose DP (Table 2). As hemicelluloses negatively affect lignocelluloses CrI (Xu et al. 2012; Wu et al. 2013), an increase of lignocellulose CrI in the steam-exploded residues may be partially due to the large hemicelluloses extractions with the steam explosion in three fiber crops. Furthermore, the steam explosion could increase lignocellulose CrI values by 12%, 23% and 22%, but it reduced cellulose DP by 52%, 42%, and 41% in the jute, kenaf, and ramie species, respectively (Table 2), consistent with the recent report that steam explosion predominately reduces cellulose DP in cotton stalks (Huang et al. 2015). Hence, the fact that jute showed the lowest CrI increasing rate (12%) and the highest DP reducing rate (52%) among the three fiber crops, should be due to its effective co-extractions of both hemicelluloses and lignin with steam explosion (Table 1). Notably, the jute had lower CrI and DP values than that of the kenaf and ramie in the steam-exploded residues (Table A.4), consistent with the observations that jute had the highest hexoses yields under the pretreatment of steam explosion followed with the dilute acid or alkali pretreatments in three fiber crops (Fig. 1). As hemicelluloses and lignin features could affect biomass enzymatic digestibility in many plant species (Hendriks et al. 2009; Jordan et al. 2012; Wu et al. 2013), hemicellulosic monosaccharides and lignin monomers (monolignols) were measured in the three fiber crops (Tables 3 and 4). In terms of the hemicelluloses fraction extracted with 4 M KOH, the crops exhibited more than 90% xylose (Xyl) and minor other monosaccharides in the raw stalks (Table 3). However, a high proportion of glucose was observed in the steam-exploded residues, in particular jute’s, which suggests that the increased glucose of steam-exploded residues was from the partial conversion of crystalline cellulose to poor/non-crystalline cellulose that was co-extracted with hemicelluloses. In terms of the Xyl/Ara ratio, jute showed a much reduced Xyl/Ara ratio in the steam-exploded residues, whereas ramie showed an increased ratio, and kenaf was not very much altered (Table 3). On the other hand, jute had a higher Xyl/Ara ratio (128) than those of both kenaf (52) and ramie (63) in the raw stalks but showed a much lower Xyl/Ara ratio (18) than those of kenaf (52) and ramie (107) in the steam-exploded residues. Since Xyl/Ara is the main factor negatively affecting biomass enzymatic digestibility in many plant species examined (Wu et al. 2013; Li et al. 2013; Li et al. 2014a; Jia et al. 2014), the fact that jute showed much reduced Xyl/Ara ratio in the steam-exploded residue was consistent with its much increased hexoses yields (Fig. 1). By comparison, kenaf did not show Xyl/Ara alteration, whereas ramie exhibited a much increased Xyl/Ara ratio in the steam-exploded residues (Table 3), consistent with the findings that kenaf had a much lower hexoses yield than that of jute. Recently, lignin has been characterized as playing dual roles in biomass saccharification (Studer et al. 2011; Xu et al. 2012; Wu et al. 2013; Li et al. 2014c), due to the distinct proportions of three monolignols in different plant species examined (Boerjan et al. 2003; Klinke et al. 2004). In this study, a large variation of three monolignols was found among the three fiber crops (Table 4). In the raw stalks, ramie exhibited much lower coniferyl alcohol (G) and relatively higher p-coumaryl alcohol (H) proportions, compared with jute and kenaf. Ramie also had a very much lower sinapyl alcohol (S), by 9 to 10 folds, compared to that of jute and kenaf in the steam-exploded residues, leading to much low S/G and S/H ratios (Table 4). Furthermore, jute and kenaf showed quite different G/H and S/H ratios in both raw stalks and steam-exploded residues, and all three fiber crops had an extremely low H-monomer level in the raw stalks, greatly different from the grass plants that have been examined (Xu et al. 2013; Wu et al. 2013; Li et al. 2014a). In addition, a correlation analysis was performed between monolignol levels (μmol/g dry matter of the steam-exploded residues) and hexoses yields of enzymatic hydrolysis (Table A.5). Notably, only G-monomer exhibited a negative correlation with the hexoses yields under all pretreatments performed at p < 0.01 (n = 3), suggesting that the G-monomer may mainly determine the lignin negative effect on biomass digestibility in three fiber crops. Hence, the steam explosion could distinctively extract lignin in the three fiber crops, which caused greatly different monolignol proportions and thus affecting biomass enzymatic saccharification. To gain insights into the mechanism of how steam explosion distinctly enhances biomass saccharification in the three fiber crops, a further correlation analysis was carried out between the altered amounts (μmol/g, dry matter) of hemicellulosic monosaccharides and three monolignols under steam explosion (Fig. 3). As a result, a positive correlation was found between the altered Xyl and the G-monomer at p < 0.01 (Fig. 3). Notably, an extremely high positive correlation coefficient (0.999) was observed between the altered Xyl and G-monomer upon the steam explosion, leading to an almost linear relationship of Xyl and G-monomer in three fiber crops (Fig. 3). This also suggests that Xyl may have a relatively tight interaction with G-monomer that mainly determines lignin-hemicelluloses co-extraction with steam explosion. In addition, kenaf and ramie showed increased G-monomer amounts in the steam-exploded residues (Table A.6), compared to the jute with a reduced amount, indicating that kenaf and ramie had much less lignin extraction with steam explosion than that of jute (Table 1). In summary, a hypothetical model could be proposed to elucidate the steam explosion distinct enhancements on biomass saccharification for the three fiber crops (Fig. A.1). In general, the steam explosion could largely extract hemicelluloses in all three fiber crops, as reported in other plant species (Alvira et al. 2010; Chen and Liu 2007; Qiu and Chen 2012), but it could only co-extract large amount of lignin in jute, in contrast to the cases of kenaf and ramie. The large co-extraction of hemicelluloses and lignin in jute was due to an efficient removal of both Xyl and G-monomer with the steam explosion. Hence, the hemicelluloses and lignin co-extractions with steam explosion could cause greatly reduced cellulose DP (Table 2), hemicellulosic Xyl/Ara (Table 3), and G-monomer (Table A.6) in jute, which had an integrative and positive effect on biomass saccharification. By comparison, kenaf did not exhibit much altered Xyl/Ara and G-monomer under steam explosion, thereby resulting in a much lower biomass digestibility compared with jute (Fig. A.1). In addition, despite the fact that ramie showed reduced cellulose DP, it had the lowest biomass saccharification among three fibers crops (Figs. 1 and 2), probably due to a large increase in Xyl/Ara ratio (Table 3) and G-monomer level (Table A.6) in the steam-exploded residues. Steam explosion pretreatment led to enhanced biomass enzymatic digestibility distinctive in three fiber crops, and the subsequent dilute acid/alkali pretreatments further increased hexoses yields from enzymatic hydrolysis. Without steam explosion, extremely high concentration alkali (16% NaOH) pretreatment could also result in high hexoses yield in raw biomass samples. Steam explosion could effectively co-extract hemicelluloses and lignin in the jute, leading to its highest hexoses yield among three fiber crops. Cellulose DP, hemicellulosic Xyl/Ara, and lignin G-monomer are the main factors that negatively affect biomass enzymatic saccharification in the three crops. This work was supported in part by grants from the 111 Project of Ministry of Education of China (B08032), and HZAU Changjiang Scholar Promoting Project (52204-07022). Chen, F., and Dixon, R.A. (2007). “Lignin modification improves fermentable sugar yields for biofuel production,” Nat. Biotech. 25(7), 759-761. DOI: 10.1038/nbt1316. Hendriks, A. T. W. M., and Zeeman, G. (2009). “Pretreatments to enhance the digestibility of lignocellulosic biomass,” Bioresour. Technol. 100, 10-18. Jia, J., Yu, B., Wu, L. M., Wang, H. W., Wu, Z. L., Li, M., Huang, P. Y., Feng, S. Q., Chen, P., Zheng, Y. L., and Peng, L. C. (2014). “Biomass enzymatic saccharification is determined by the non-KOH-extractable wall polymer features that predominately affect cellulose crystallinity in corn,” PLoS One2014, 9: e108449. DOI: 10.1371/journal.pone.0108449. Li, Z. R., Zhao, C. Q., Zha, Y., Wan, C., Si, S. L., Liu, F., Zhang, R., Li, F. C., Yu, B., Yi, Z. L., Xu, N., Peng, L. C., and Li, Q. (2014c). “The minor wall-networks between monolignols and interlinked-phenolics predominantly affect biomass enzymatic digestibility in Miscanthus,” PLoS. One. 9, e105115. DOI:10.1371/journal.pone.0105115. Li, F., Zhang, M. L., Guo, K., Hu, Z., Zhang, R., Feng, Y. Q., Yi, X. Y., Zou, W. H., Wang, L. Q., Wu, C. Y., Tian, J. S., Lu, T. G., Xie, G. S, and Peng, L. C. (2014d). “High-level hemicellulosic arabinose predominately affects lignocellulose crystallinity for genetically enhancing both plant lodging resistance and biomass enzymatic digestibility in rice mutants,” Plant Biotechnol. J., pp. 1-12. DOI: 10.1111/pbi.12276. Article submitted: August 21, 2015; Peer review completed: October 1, 2015; Revised version received: December 1, 2015; Accepted: December 20, 2015; Published: January 19, 2016.